Casing is large diameter pipe that is assembled and inserted into a recently drilled section of a borehole and typically held into place with cement. Prevent contamination of fresh water well zones. Prevent unstable upper formations from caving-in and sticking the drill string or forming large caverns. Provides a strong upper foundation to use high-density drilling fluid to continue drilling deeper. Isolates different zones, that may have different pressures or fluids – known as zonal isolation, in the drilled formations from one another. Prevents fluid loss into or contamination of production zones. Provides a smooth internal bore for installing production equipment. A slightly different metal string, called production tubing, is often used without cement in the smallest casing of a well completion to contain production fluids and convey them to the surface from an underground reservoir. In the planning stages of a well a drilling engineer, usually with input from geologists and others, will pick strategic depths at which the hole will need to be cased in order for drilling to reach the desired total depth. This decision is often based on subsurface data such as formation pressures, strengths, and makeup, and is balanced against the cost objectives and desired drilling strategy. With the casing set depths determined, hole sizes and casing sizes must follow. The hole drilled for each casing string must be large enough to easily fit the casing inside it, allowing room for cement between the outside of the casing and the hole. Also, the inside diameter of the first casing string must be large enough to fit the second bit that will continue drilling. Thus, each casing string will have a subsequently smaller diameter. The inside diameter of the final casing string (or penultimate one in some instances of a liner completion) must accommodate the production tubing and associated hardware such as packers, gas lift mandrels and subsurface safety valves. Casing design for each size is done by calculating the worst conditions that may be faced during drilling and production. Mechanical properties of designed pipes such as collapse resistance, burst pressure, and axial tensile strength must be sufficient for the worst conditions. Casing strings are supported by casing hangers that are set in the wellhead, which later will be topped with the Christmas tree. The wellhead usually is installed on top of the first casing string after it has been cemented in place. The conductor casing serves as a support during drilling operations, to flowback returns during drilling and cementing of the surface casing, and to prevent collapse of the loose soil near the surface. It can normally vary from sizes such as 18″ to 30″. The purpose of surface casing is to isolate freshwater zones so that they are not contaminated during drilling and completion. Surface casing is the most strictly regulated due to these environmental concerns, which can include regulation of casing depth and cement quality. A typical size of surface casing is 13⅜ inches. Intermediate casing may be necessary on longer drilling intervals where necessary drilling mud weight to prevent blowouts may cause a hydrostatic pressure that can fracture shallower or deeper formations. Casing placement is selected so that the hydrostatic pressure of the drilling fluid remains between In order to reduce cost, a liner may be used which extends just above the shoe (bottom) of the previous casing interval and hung off downhole rather than at the surface. It may typically be 7″, although many liners match the diameter of the production tubing. 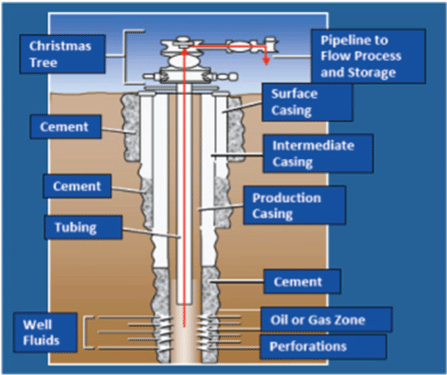 Few wells actually produce through casing, since producing fluids can corrode steel or form deposits such as asphaltenes or paraffin waxes and the larger diameter can make flow unstable. Production tubing is therefore installed inside the last casing string and the tubing annulus is usually sealed at the bottom of the tubing by a packer. Tubing is easier to remove for maintenance, replacement, or for various types of workover operations. It is significantly lighter than casing and does not require a drilling rig to run in and out of hole; smaller “service rigs” are used for this purpose. Cementing is performed by circulating a cement slurry through the inside of the casing and out into the annulus through the casing shoe at the bottom of the casing string. In order to precisely place the cement slurry at a required interval on the outside of the casing, a plug is pumped with a displacement fluid behind the cement slurry column, which “bumps” in the casing shoe and prevents further flow of fluid through the shoe. This bump can be seen at surface as a pressure spike at the cement pump. To prevent the cement from flowing back into the inside of the casing, a float collar above the casing shoe acts as a check valve and prevents fluid from flowing up through the shoe from the annulus. Casing and tubing strings are the main parts of the well construction. All wells drilled for the purpose of oil or gas production (or injecting materials into underground formations) must be cased with material with sufficient strength and functionality. The cost of casing is a major part of the overall well cost, so selection of casing size, grade, connectors, and setting depth is a primary engineering and economic consideration. Conductor casing Conductor casing is the first string set below the structural casing (i.e., drive pipe or marine conductor run to protect loose near-surface formations and to enable circulation of drilling fluid). The conductor isolates unconsolidated formations and water sands and protects against shallow gas. This is usually the string onto which the casing head is installed. A diverter or a blowout prevention (BOP) stack may be installed onto this string. When cemented, this string is typically cemented to the surface or to the mudline in offshore wells. Surface casing is set to provide blowout protection, isolate water sands, and prevent lost circulation. It also often provides adequate shoe strength to drill into high-pressure transition zones. In deviated wells, the surface casing may cover the build section to prevent keyseating of the formation during deeper drilling. This string is typically cemented to the surface or to the mudline in offshore wells. It is often set in the transition zone from normal to abnormal pressure. The casing cement top must isolate any hydrocarbon zones. Some wells require multiple intermediate strings. Some intermediate strings may also be production strings if a liner is run beneath them. A good primary cement job is very critical for this string. Liners can be either an intermediate or a production string. Liners are typically cemented over their entire length. Tieback string is a casing string that provides additional pressure integrity from the liner top to the wellhead. An intermediate tieback is used to isolate a casing string that cannot withstand possible pressure loads if drilling is continued (usually because of excessive wear or higher than anticipated pressures). Similarly, a production tieback isolates an intermediate string from production loads. Tiebacks can be uncemented or partially cemented. An example of a typical casing program that illustrates each of the specified casing string types is shown in Fig. 1. Tubing is the conduit through which oil and gas are brought from the producing formations to the field surface facilities for processing. Tubing must be adequately strong to resist loads and deformations associated with production and workovers. Further, tubing must be sized to support the expected rates of production of oil and gas. Clearly, tubing that is too small restricts production and subsequent economic performance of the well. Tubing that is too large, however, may have an economic impact beyond the cost of the tubing string itself, because the tubing size will influence the overall casing design of the well. Almost without exception, casing is manufactured of mild (0.3 carbon) steel, normalized with small amounts of manganese. Strength can also be increased with quenching and tempering. API has adopted a casing “grade” designation to define the strength of casing steels. This designation consists of a grade letter followed by a number, which designates the minimum yield strength of the steel in ksi (103 psi). Threads are used as mechanical means to hold the neighbouring joints together during axial tension or compression. For all casing sizes, the threads are not intended to be leak resistant when made up. API Spec. 5C2, Performance Properties of Casing, Tubing, and Drillpipe, provides information on casing and tubing threads dimensions. In round threads, two small leak paths exist at the crest and root of each thread. Buttress threads have a much larger leak path along the stabbing flank and at the root of the coupling thread. API connections rely on thread compound to fill these gaps and provide leak resistance. The leak resistance provided by the thread compound is typically less than the API internal leak resistance value, particularly for buttress connections. The leak resistance can be improved by using API connections with smaller thread tolerances (and, hence, smaller gaps), but it typically will not exceed 5,000 psi with any long-term reliability. Applying tin or zinc plating to the coupling also results in smaller gaps and improves leak resistance. Also, efficiency in flush joint, integral joint or other special clearance applications improves connections. A large diameter (> 16 in.) pipe improves the stab-in and makeup characteristics; galling should be reduced (particularly in CRA applications and tubing strings that will be re-used); and connection failure under high torsional loads (e.g., while rotating pipe) should be prevented. The “premium” performance of most proprietary connections comes at a “premium” cost. Increased performance should always be weighed against the increased cost for a particular application. As a general rule, it is recommended to use proprietary connections only when the application requires them. “Premium” performance may also be achieved using API connections if certain conditions are met. When requesting tensile performance data, make sure that the manufacturer indicates whether quoted tensile capacities are based on the ultimate tensile strength (i.e., the load at which the connection will fracture, commonly called the “parting load”) or the yield strength (commonly called the “joint elastic limit”). If possible, it is recommended to use the joint elastic limit values in the design so that consistent design factors for both pipe-body and connection analysis are maintained. If only parting load capacities are available, a higher design factor should be used for connection axial design. The overall mechanical integrity of a correctly designed casing string is dependent upon a quality assurance program that ensures damaged connections are not used and that operations personnel adhere to the appropriate running procedures. Threads on ends are particularly liable to damage by rough handling, even though thread protectors are fitted. Threaded ends so damaged may be cut and re-threaded in the oil-fields, where special machinery is usually available. Bends and dents, if not too severe, may also be straightened by special machinery in the larger oilfield centres, but, as oilwell casing is subject to high pressure, such repairs must be tested and inspected by technical processes, which are expensive.